The Group strives to adopt a balanced approach towards people, planet and profit in achieving its corporate visions. In doing so, the Group is fully committed to undertake sustainable agricultural practices, good corporate governance, high standards of occupational safety, health and welfare for the workforce and exercise corporate social responsibility towards the local communities within the Group’s operating landscape. SOPB practices responsible and good agricultural practices from its first oil palm plantation developed in the late 1960’s when it was jointly established between Commonwealth Development Cooperation (CDC) and the Sarawak State Government. These agricultural polices, good management practices and methodologies were further refined and improved incorporating sustainable agricultural practices to include social and environmental aspects. As a leading oil palm plantation company in Sarawak and operating largely in rural areas, we have contributed and are committed to grow together with our local communities in creating jobs and alleviating poverty so as to improve lives of the present and future generations. We are working closely with like-minded business partners who are committed to sustainability as we are. Our Group Corporate Governances that promote sustainability and at the same time create values and protection. SOPB practices responsible and good agricultural practices. Reviewed and updated the standard operating procedures incorporating sustainability aspects including Practice NO Burning for new development and replanting activities. Launched the first Occupational Safety and Health (OSH) Policy. 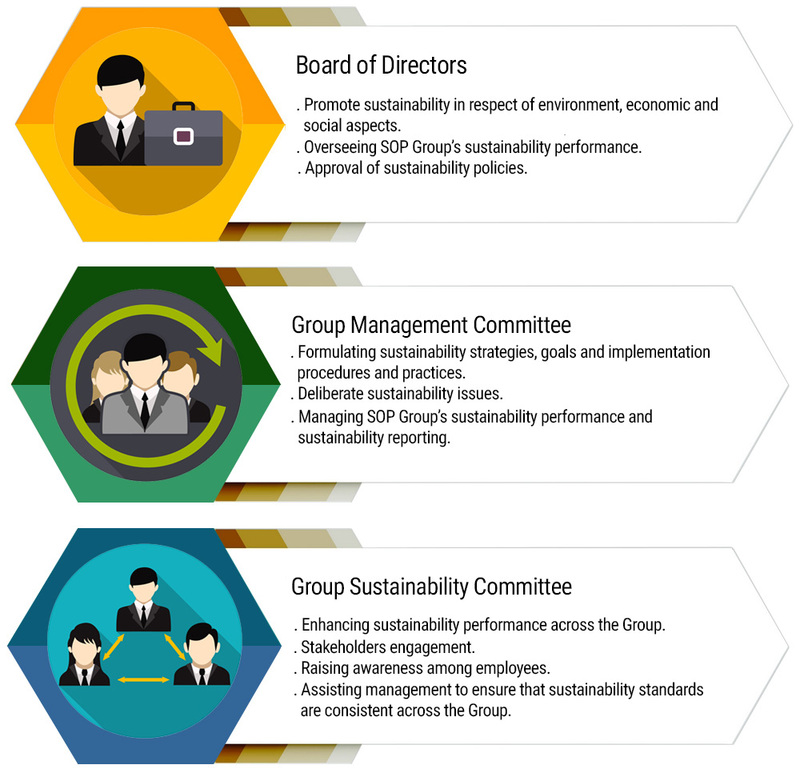 Formally established a Sustainability Unit within the SOPB Group operational premises. Launched Environmental Sustainability Policy and Social and Community Policy. Participated in MPOB MSPO certification standard Pilot Audit for 1 Palm Oil Mill and 1 Estate (Galasah POM and Sg. Balim Estate). 100 % Traceable to SOPB Group Plantations. Published first SOPB Sustainability Report. Established the Tinbarap Conservation Area earmarked for conservation project where several research studies are on-going. Collaboration project between MPOB and SOPB on "The Development of Infrastructure and the Research Programme on Ecosystem Carbon and Nitrogen Dynamics of Tropical Peatland in Sebungan / Sabaju Estate, Sebauh Bintulu". Participated in MPOB MSPO General Principle for Refinery Pilot Audit (SOPEO). Formally reviewed and established Group guideline on the "Protection of Riparian Buffer Zone & Slope Policy and Guidelines on Establishment of Riparian Buffer Zone". Undergone MSPO Accreditation Audit witnessed by DSM & MPOCC for Sepakau POM & its supplying estates. Engaged with RSPO approved Consultant to conduct High Conservation (HCV) and Land Use Change Assessment (LUCA) for the Group planting post December 2005. Collaboration project between MPOB, SOPB and Universiti Malaysia Sarawak (UNIMAS) aims to assess and quantify carbon stock, floristic composition, and biodiversity of tropical peat swamp forest designated as HCV Area in Tinbarap Estate Miri. Collaboration project between MPOB, SOPB and Nagoya University on "Balancing Development of Oil Palm Plantations with Conservation of Tropical Forest Ecosystem". 100% ISCC certification for all eligible operation units. Published first Group Sustainability Report in line with the newly published Global Reporting Initiative (GRI) Standards issused by Global Sustainability Standards Board. 3rd review of Occupational Safety and Health (OSH) Policy in May 2017. Participated in MPOCC programme on the MSPO Supply Chain Certification Standard (SCCS) Pilot Audit for Refinery (SOPEO), Biodesel Plant (SOPGE) and Sabaju Palm Oil Mill (SaPOM). Launched the Oil Palms Sustainability Policy. Launched the Sustainability Dashboard on SOPB website to report on Sustainability Progress. Revision of "Whistle-Blowing Policy & Procedure" to assist employees and stakeholders to raise concerns in a safe manner on all improper conduct observed within SOPB without fear of retaliations. Launched the Free, Prior and Informed Consent (FPIC) Procedure.